Silverfish, in the order Thysanura (tassel tail), have been around for a very long time. They’re tied, in fact with springtails of recent BOTW fame, for the “Oldest Insect Fossil” recognition (depending on how liberally you define insects). About 400 million years. Most insects have wings, and the ancestors of most of today’s wingless insects once had wings. Insects like silverfish and springtails are called “primitively wingless” because neither they nor their ancestors ever had wings. They do have 6 legs and 3 body parts and segmented bodies, and although their status has been debated for a long time, they are generally considered to be a primitive insect. 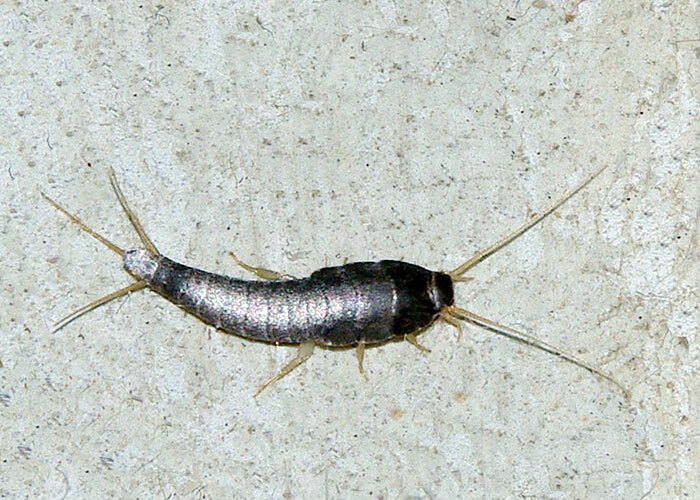 There are about 250 species of silverfish/bristletails worldwide, 40 in North America, and most are outdoor critters. Your common, household silverfish, the one that caused the BugLady’s Sainted Granny to store her daughters’ luggage in the garage when they came home from college, is Lepisma saccharina (sugar-taker), which lives in cool, damp places. Its antennae and its tails are shorter than its body. It feeds on house dust, bits of dried vegetation, those small insect body parts that get restaurants in trouble, sawdust, and starch, which it gleans from wallpaper paste and from the glues used in book-binding (all of which explains the BugLady’s resident population). Hubbell says that back in the good-olde-days, when men wore heavily-starched, detachable collars, it was common to open the collar drawer and watch multitudes of silverfish racing for the shadows, and that a lot of what has been written about them is more than 60 years old. The humble silverfish possesses an astonishing sensory system, much of which can be regenerated if necessary. According to Hubbell, it is essentially deaf and has eyes that indicate only light and dark (it prefers dark), but approximately six kinds of sense receptors in its antennae tell it about the size and shape of the spaces it moves through, along with “many other things that are unknown to us in our largely visual and aural world.” She goes on to say that it possesses “an array of chemical and tactile sensitivities so varied and precise that we… can have no real understanding of what a silverfish’s world is like.” In addition, the “slightest change in air current sets off sensory hairs” in a silverfish’s body. As its antennae navigate the dark spaces, its tail filaments drag behind, analyzing the substrate. Wowsers!! Another surprise is its ardent courtship dance. Advancing and retreating, with antennae and tail filaments waving and quivering, whirling their abdomens in a torrid choreography, the male and female court. Eventually, he spins threads from the tip of his abdomen and encloses a spermatophore or sperm packet. At his touch, the female advances into his web, picks up the spermatophore, and uses it to fertilize her eggs. She must dance each time she lays eggs. She lays her eggs in cracks and crevices. If she picks a hospitable microclimate, her eggs will hatch looking like mini adults and grow slowly. If not, her young will not develop properly within their eggs and will die while hatching. Silverfish live several years and molt more than a dozen times (they are unusual among insects because they continue to shed their exoskeletons after becoming adults). A molting silverfish is, momentarily, a helpless silverfish, and it might get cannibalized if one of its confreres discovers it thus incapacitated.